The Tour de Forest rally is going down in Olympia, Washington this weekend, and it’s short one competitor thanks to some damn grand theft rally. 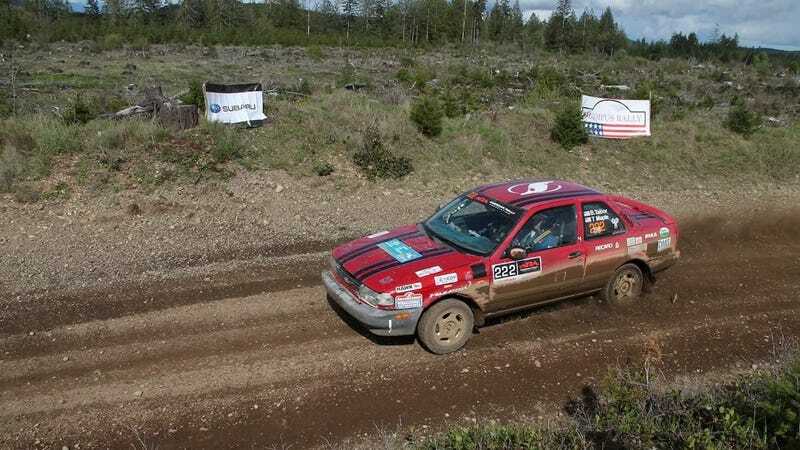 Early on Saturday morning, this 1991 Nissan Sentra SE-R, in full rally livery and with an extensive West Coast rally history, was stolen from the parking lot of Hotel Red Lion Olympia. The car had run reconnaissance on the stages all day Friday, and was tucked in for the night at 10:30PM. The next morning when the team woke up to check in for Parc Expose, and their red machine was missing. Being a proper American Rally Association event prepped car, it did have an EZ Tracker system onboard, which was pinged at 3AM when the car was stolen. According to a member of the team, the car was headed south on I5, outside of Tumwater, WA, but the tracker was turned off shortly after. The car was obviously street legal, and was driven to the event rather than trailered. The team says they believe the car was targeted out of sheer laziness, as the old and loose key tumblers will accept almost any era Nissan key. B13-generation Sentra SE-R models are getting quite thin on the ground these days, but were once the top of the sport compact heap. With a 140-horsepower SR20DE engine in a lightweight two-door chassis, a factory limited slip, four-wheel disc brakes, and independent suspension, it was a proper weapon straight out of the box, and an excellent choice for rally. A lot of effort has gone into preparation and specification of this particular example to make it more rally ready. It seems awfully ballsy of the thieves to steal a car that literally has the names of the driver and co-driver plastered on the outside. I’ve driven liveried cars on the street before, and it isn’t as though they’re inconspicuous. Obviously the team has already missed their opportunity to compete in the rally this weekend, but they’d like to continue running this car in future events. Let’s help them if we can. If you have any information on this Sentra or its whereabouts, please reach out to us at tips@jalopnik.com.